AstroGrav is a full-featured, high precision solar system simulator that calculates the gravitational interactions between all astronomical bodies, so that the motions of asteroids and comets are simulated much more accurately than with planetarium applications. The effects of general relativity and radiation pressure can be taken into account, and superb interactive 3D viewing allows you to easily rotate and zoom your view while the solar system evolves. 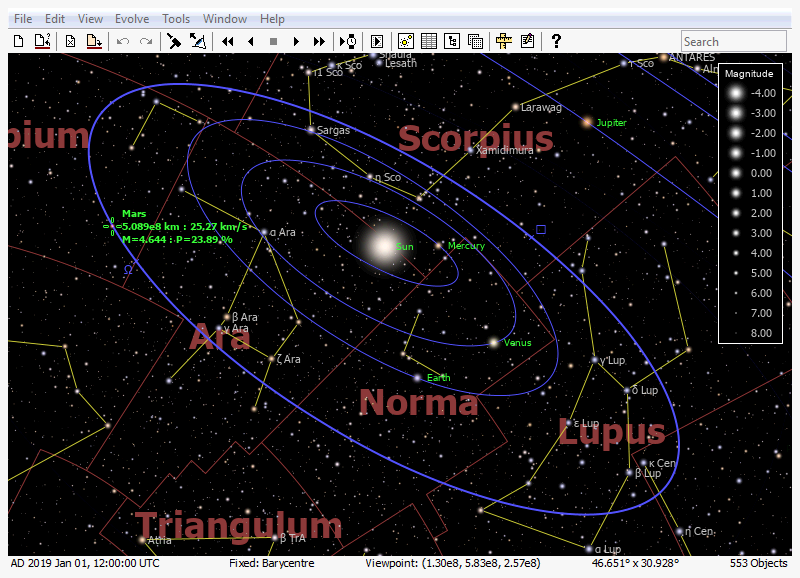 The AstroGrav software has a huge range of features and viewing options, including views from space or any object, planetarium-style views from any location on Earth, multiple views animated simultaneously, dynamically calculated orbits and trajectories, comprehensive tabular data, and simulation time steps from a fraction of a second to thousands of years. Constellations and over 100,000 background stars are included, with comprehensive data for every star. Several different celestial coordinate grids and a wide range of physical units are available, and editing facilities allow you to create new objects manually, or import from hundreds of thousands of asteroids and comets. Because it calculates the motions of bodies from their gravitational interactions, AstroGrav is not restricted to just the solar system. Any situation in which gravity is the only significant force can be simulated, and the illustrative sample files that are included with AstroGrav include many examples such as exoplanet systems, protoplanets that evolve into planetary systems, rubble piles and their interactions with massive bodies, complex star systems, and even projectiles and bouncing balls. AstroGrav is ideal for astronomers, astrophysicists, researchers, teachers, educationalists, and students, and comes complete with a tutorial and full documentation. A fully functional 15 day trial version is available for download and evaluation.